YES, Cats can be trained! Contrary to popular opinion, our feline companions can be taught to perform on cue. All successful training is accomplished through praise and food rewards. While direct correction is employed in canine training, it only confuses, frightens, and alienates felines. (Dogs, being pack animals, are used to being dominated by a higher ranking member of the pack; while cats, being solitary predators, avoid or attack those who show hostility toward them, or try to make them do something that they don’t want to.) The key is to discover what food treat is the most appealing to your cat and to present it to him immediately each time he responds to a verbal cue with the desired behavior. Does your cat come when called? He should. This is basic feline training. Even though your cat may never go outside, he should master this simple point of feline etiquette. It may come in handy some day. First, decide how you will call him. Will it be “Here kitty, kitty, kitty” or do you prefer to call him by name? (Cats respond most readily to names ending with a long “ee” sound.) Call your cat before you put down his most delicious meal of the day or reward him for coming with a special food treat. It’s that easy! You may also try the clicker training method. Mounted on a stable, non-tippable base. 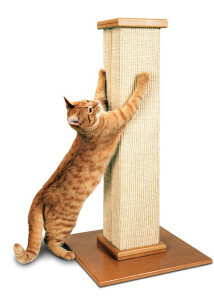 You can make one yourself (see “How to build a scratching post”) or Pioneer Pet® makes a well-designed post that meets all the above criteria. It should be placed in front of the previous scratching target–usually in a room where the cat and the family spends a lot of time. 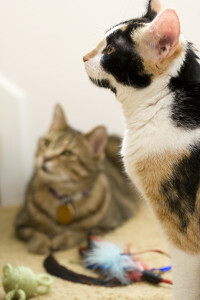 To encourage the cat to use it, scratch on the post with your nails and call the cat over (cats are great imitators). Praise him profusely whenever he scratches on it. It will become a healthy and satisfying life-long habit.